The results of quantitative relationship evaluation of the dominant types of cutting tools wear, and the results of relative evaluation of general communication tool wear with the reasons for its occurrence are presented in the article. Keywords: wear resistance, wearing, deformation, cutting tool, factor, surface, adhesion, processing by the magnetic field. Reference toolmaker / Ordinartsev I.A., Filippov G.V., Shevchenko A.N. – L: Mashinostroenie, 1987. – 846 p.
Loladze T.N. Strength and durability of the cutting tool. – Moskow: Mashinostroenie, 1982. – 320 p.
Yashcheritsyn P.I. The theory of cutting – Mn. : New edition, 2006. – 512 p.
Talantov N.W. Physical basis of the cutting process, tool wear and failure. – Moskow: Mashinostroenie, 1992. – 240 p.
Zelinskiy V.V. 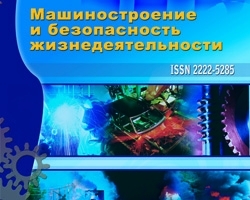 For establishmeht nature influence of magnetic field for resist wear // Engineering industry and life safety, 2011, № 1. P. 33-36. Zelinskiy V.V., Karpov A.V. Causal aspect of wear of cutting tools // Bulletin PSTU. Engineering, materials science. Volume 13. № 3, Perm, 2011, p. 46-50. Borisova E.A., Identification of the predominant species and causes wear of cutting tools, №2 (12) 2012, Zelinskiy V.V.